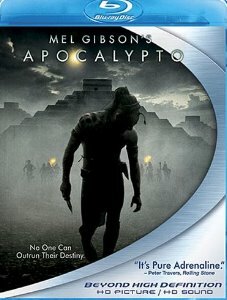 From Mel Gibson, director of the Academy Award-winning Braveheart (Best Director, Best Picture, 1995), comes Apocalypto, the thrilling historical epic that will shock and awe you as never before on Blu-Ray Disc. Dubbed "totally mesmerizing" by Dark Horizons, this adrenaline-drenched action-adventure reaches new levels of intensity in this extraordinary format. 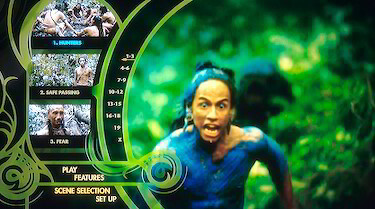 In the twilight of the mysterious Mayan culture, young Jaguar Paw is captured and faces a harrowing end. Driven by the power of his love for his family, he makes a heart-racing escape to rescue them and ultimately save his way of life. 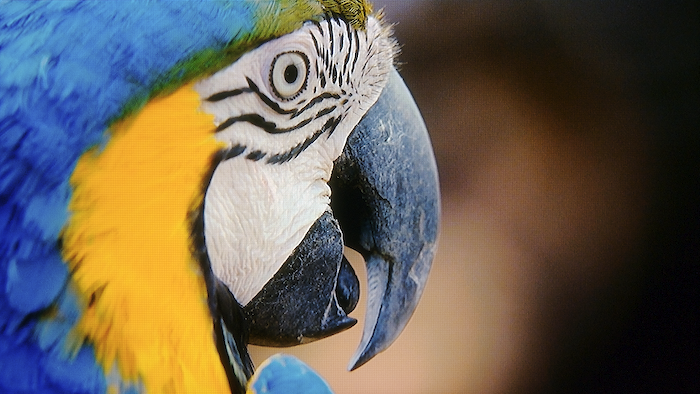 Experience both the pristine beauty and the unparalleled savagery of this ancient world in eye-popping clarity. 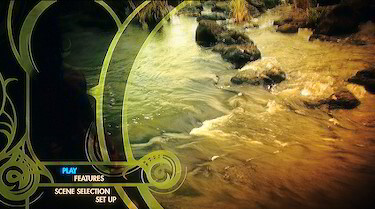 Hear the rustle of every leaf and the cries of fierce warriors with spectacularly advanced audio technology. Embark on this mind-bending, gut-wrenching journey back in time with Blu-ray-High-Definition. 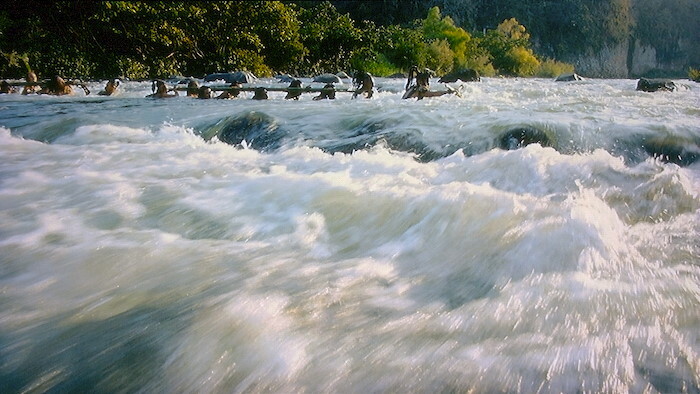 With Apocalypto, Mel Gibson has proven it's possible to create a compelling action/adventure film in almost any setting. 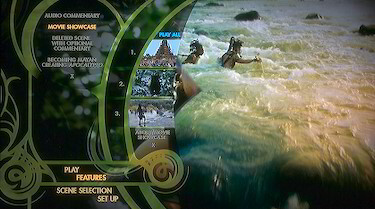 Gibson's theme (which is only partially developed), as revealed in an opening caption, is that all great civilizations fail when they begin to rot from the inside. 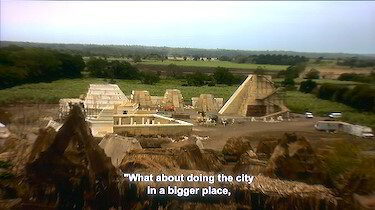 Over the next 2 1/4 hours, he provides glimpses into the degeneracy of the Mayan society on the eve of its encounter with the Spanish conquistadores. 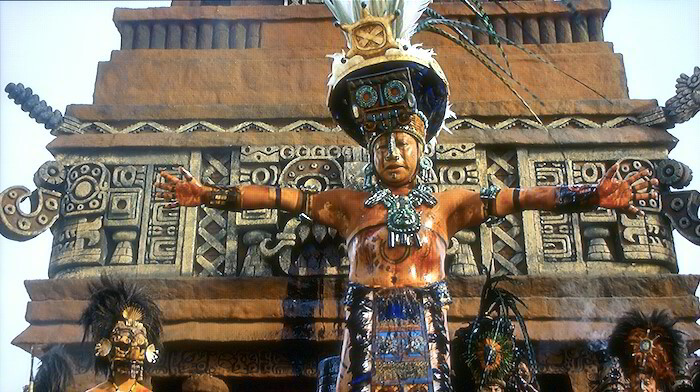 However, Apocalypto is not a political tract or a dissertation about why the Mayan age came to an end. Instead, it's a high-octane adventure that concludes with one of the most intense extended chase sequences in recent movie history. 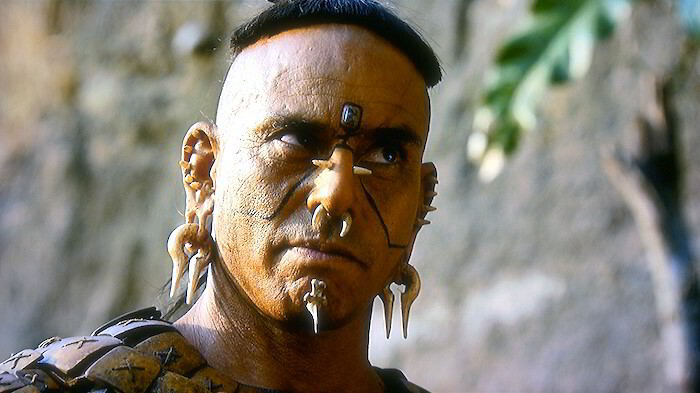 Like two of Gibson's previous movies, Braveheart and The Passion of the Christ, Apocalypto doesn't avoid depictions of brutal, graphic violence. It is worth noting that some of the most heinous crimes, such as the rapes, occur off screen. Gibson makes it clear what's transpiring, but he doesn't feel the need to subject the audience to that. There's still plenty of blood and gore, including at least one instance in which the slitting of a throat is shown in unbroken detail. 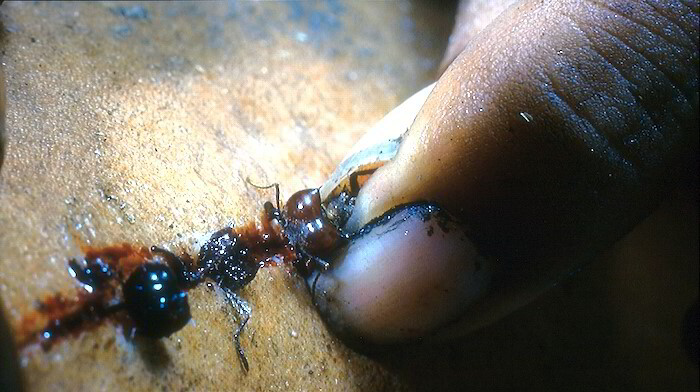 This is not a movie for the faint of heart. There are more similarities to Braveheart than The Passion of the Christ. (While in the comparison game, it would be unfair to ignore the Aussie post-apocalyptic chase movie Mad Max, in which Gibson starred before his Hollywood career ignited.) 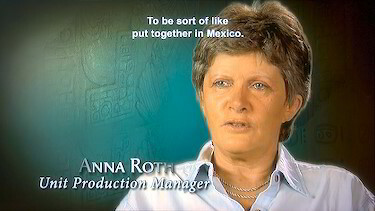 Although the plot of Apocalypto is considerably different than that of Gibson's Oscar-winning picture, the spirit is much the same. This movie is about heroism and overcoming odds. 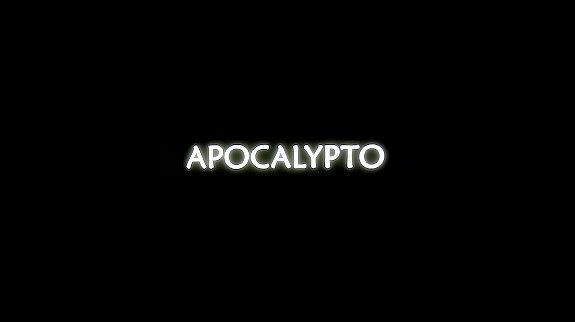 Aside from the aforementioned violence, the only thing Apocalypto has in common with The Passion of the Christ is that both are subtitled. Because of this, a cynic could argue that Gibson has made the most expensive art-house action movie of all time. 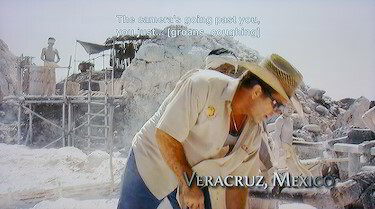 Will enough people put aside their aversion of subtitles in order to make this profitable? 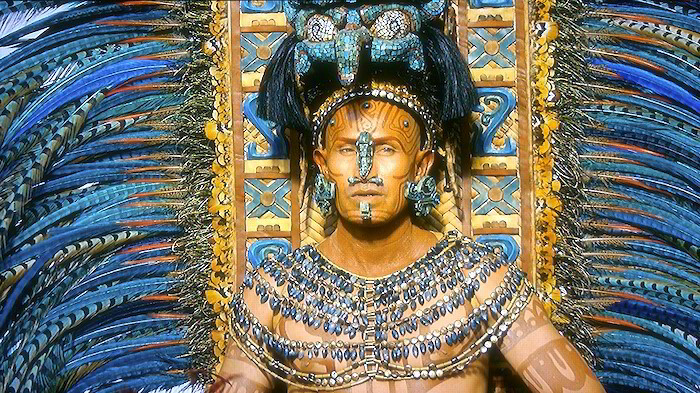 If all the movie represents is a lot of pretty scenery and well executed action sequences, there would be nothing distinguishing about Apocalypto. However - and here's where the Braveheart parallel is the strongest - Gibson succeeds in forging a strong bond between the audience and the protagonist. This is done quickly and economically. 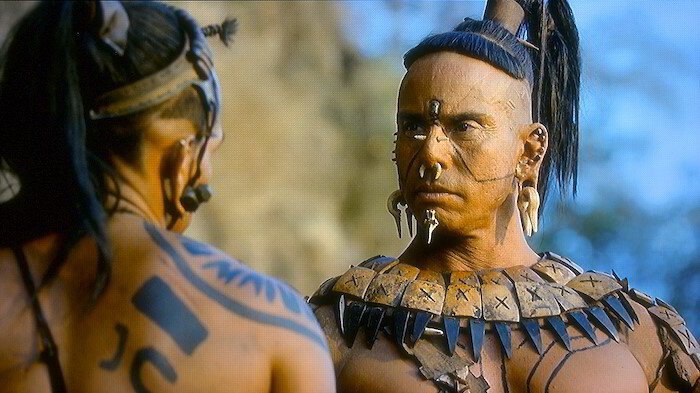 We are shown the love Jaguar Paw has for his wife and son and the lengths to which he will go to keep them safe. He is also depicted as resourceful and durable. On more than one occasion, I found myself thinking of him as the MacGyver of the jungle. To provide an effective balance, we are then introduced to a villain, Zero Wolf (Raoul Trujillo), who is as intelligent and dangerous as he is detestable. To up the ante, there's a second bad guy, Snake Ink (Rodolfo Palacios), who we probably want to see die even more than his boss, Zero Wolf. Snake Ink delights in torturing our hero when Zero Wolf isn't looking. 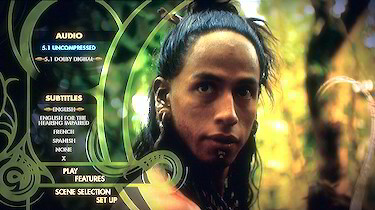 Apocalypto represents a forceful two-plus hours and it isn't for everyone. I appreciate that Gibson set this in a time and place we don't often see on screen. The cameras, operated by Dean Semler, make this long-dead world come alive. 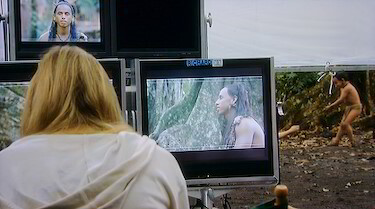 The setting makes the movie seem more exotic and less derivative, although those aspects don't lessen the excitement. Historians may quibble about the movie's accuracy, but Gibson isn't trying to make a documentary. 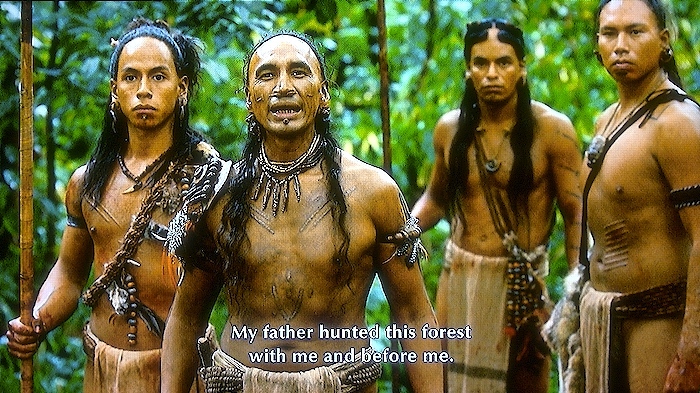 The best thing I can say about Apocalypto is that, despite belonging to an overpopulated genre, it's unlike any other movie to reach theaters this year and, because it is as visual an experience as it is visceral, it is best seen on a large screen. Excerpt from James Berardinelli's review at Reelviews.net located HERE. This is one of the best Blu-Ray images I have ever seen, and the best American DVD release I own. The image is amazingly clear, sharp and with perfectly balanced contrast. In fact the grabs don't do justice to the actual quality you see in your system. Like an exactingly compressed theatrical presentation I actually believe that this Blu-ray is superior to the image you will see in a cinema. It is flexible in that I can boost the image without difficulty (although it is not necessary), even the grains here help give a more beautiful look to the visuals. I wouldn't remove them even if I could. I feel this is reference material. Probably the best 5.1 uncompressed mix I have, the jungle environment becomes vivid, the background becomes filled with details without damaging the voice clarity. The English option here sounds like the DVD, maybe a bit better and can't be compared with the uncompressed option. The supplements are very basic, but the documentary is somewhat interesting and is pleasantly presented in high definition, 1.85:1 ratio. The other thing I found nice is that everything here is English subtitled, this is how it should be, every documentary, commentary should come with at least English SDH options. This can not only can help the hearing impaired but international audiences with limited language option as well. BOTTOM LINE: If you don't like the movie, you can use this as one of those nature imagery Blu-Rays and it's actually better than most. And if you find the violence disturbing, well it is not more than many Discovery Channel documentaries, in my opinion. The sound here is also an amazing attribute making it a great option test your system or show it off as a premium demo disc.